Parents know what it’s like, the questions and requests from teachers for baby photos, information for family trees, and questions about moms. A teachers job is hard, really hard. It’s even more difficult as class sizes grow. To remember the backgrounds of every child is difficult, but I think there should be a general understanding that there are children in the classroom who come from divorced families, are in foster care, or were adopted. For Mother’s Day, Payton’s teacher had the class answer questions about their mothers. Simple enough right? Well, one of the questions Payton had to answer was: Why were you given to your mother and not some other mother? Let that sink in for a while. I did, and it hurt. It didn’t hurt me, it hurt my daughter. 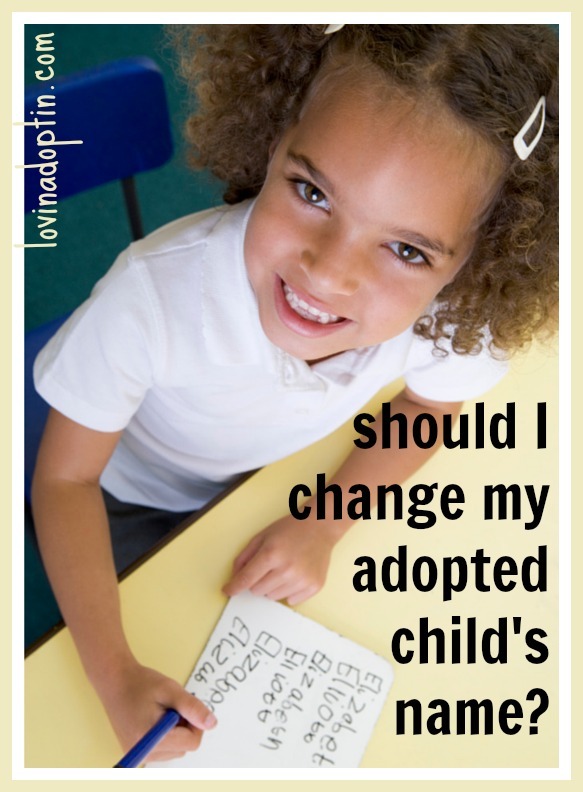 Think about how the adopted or foster child answers this question. Payton had written out a long paragraph explaining what happened to her and why she’s with another mommy. Talk about heavy. These conversations are welcome in a loving environment with Mommy and Daddy available to hug and offer answers and weed out what she’s feeling, but in class, sitting by herself? She erased her answer and wrote: My mommy likes to go swimming with me. Total avoidance of the question, and I don’t blame her. I’m proud of her. The really odd thing is, I’ve been thorough in telling Mrs. Briggs* about Payton’s past. More importantly, she’s worked with children who have Reactive Attachment Disorder, so she knows all about it, or you would think she does. For the life of me I couldn’t figure out why Mrs. Briggs would ask such a question. I mean I grew up with both my biological parents and I have no idea how I would answer this question. Ummm, because that’s who I was born to. Seems simple to me. Fate? Destiny? God’s design? Let’s take hypothetical Shalene, her relationship with her mom wasn’t good as a teen. Even if she had considered what it would be like to be born to another mother, it wouldn’t have benefited her in any way. I hate the phrase, but, it is what it is. She didn’t have any other choice, and thinking about it wouldn’t have got her anywhere besides depressed. After reading a card Payton made in class, I came to a presumption (I think I’m close to the answer) of why Mrs. Briggs asked the question I mentioned above. They used this questionnaire as an outline for their Mother’s Day cards. I think Mrs. Briggs was trying to ask the kids what’s special about their mother. Maybe it should be phrased this way. I know it may have been easier on at least four kids in the class, my daughter, a boy who’s being raised by his grandparents, a child who’s been adopted by family, and another child who’s been adopted by his grandparents. That’s a lot of kids. In todays society, it would be great if teachers would preface any questions or conversations about mothers by including those who could be the students primary caregivers; grandparents, aunts, and siblings for those who come from different family dynamics. It goes beyond Mother’s Day though, teachers need to acknowledge those diverse ways children come into families. What about children who are asked to bring in baby photos? What if the child was adopted from the Ukraine at five-years-old and they have no pictures from when they were younger? What if a child enters foster care with nothing at the age of ten? These children won’t have photos, they usually don’t even have more than the clothes on their back. When parents neglect and abuse children, they often don’t make it a priority to create family photo albums, and they usually aren’t passed on with the child if they do have any pictures. When I shared this question that came up on Payton’s paper, my friend, JoAnn*, said her adopted daughter was asked in one class: What was the worst thing that’s ever happened to you? JoAnn said her daughter was reeling for days afterwards. She adopted her daughter from Haiti after the earthquake. Mika* had been living in an orphanage when the Haiti earthquake shook the earth beneath her feet and brought down most of the city. This question brought up so many horrible, terrifying memories for her, ones that I’m sure go far beyond the orphanage and the earthquake. I don’t think this is a question most teachers would even consider asking, but it happens. Teachers are awesome, I know so many and I respect them for what they do. They get paid nothing and they have THE most important job besides parenting. My hope is that this helps teachers understand how to approach children in the classroom, considering all backgrounds. 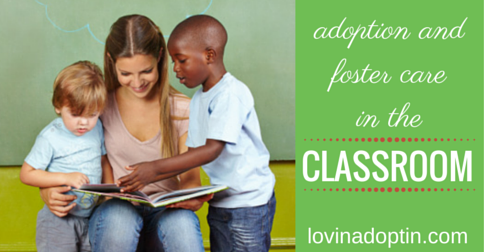 If you’re a parent and class assignments come up that make your foster or adopted child really uncomfortable, have an honest, but kind conversation with your child’s teacher. Explain where your child came from and why it’s difficult for them. I think many teachers will be open to your input so in the future they can avoid causing children emotional pain. 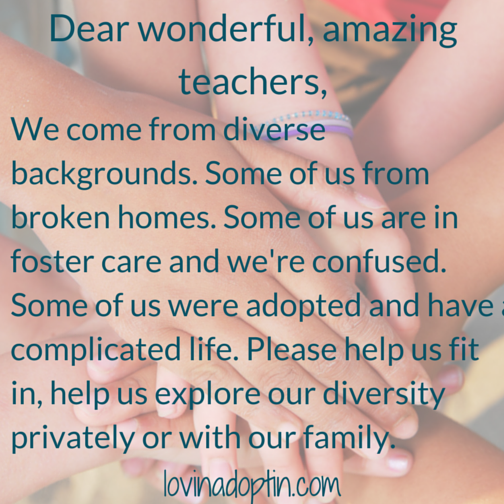 Many teachers are aware of what’s been said in this post, but there are still some who don’t understand how our families come to be. Thank you to ALL teachers for what you bring to society. *Since writing the draft of this post I’ve spoken with Payton’s teacher about this question and how it made Payton feel. Mrs. Briggs said she would speak with Payton about it and apologize to her and that she respects both of our feelings on the matter. You can receive each post made to Lovin’ Adoptin’ by subscribing in the upper right corner. If you’re on a mobile device, you may need to do this on the web version. You can also “like” my Facebook page and follow me on Twitter and Pinterest. Catherine Godone-Maresca, M.A. 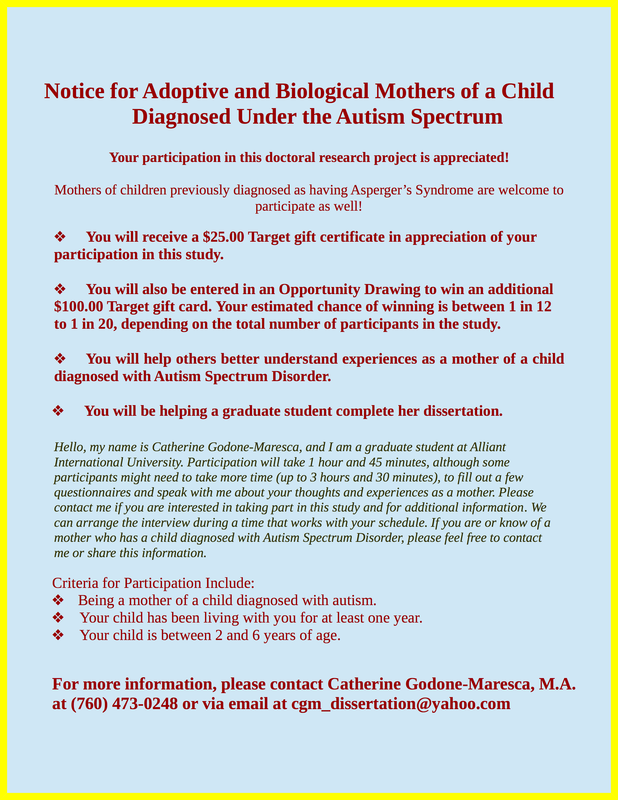 is in need of adoptive autism parents. Catherine will speak with you via phone for a short interview which will determine whether you can be part of the study. Then she’ll mail a questionnaire packet, and then do another interview over the phone after she receives your answers. should I change my adopted child’s name? What’s in a name? If you really ponder it, there’s a heck of a lot, especially for someone who’s owned their name for a while. 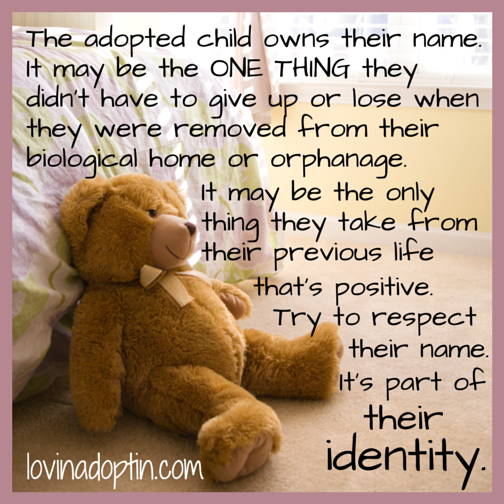 I think this is what we have to realize as adoptive and foster parents, our child owns their name, it’s theirs, it’s the ONE THING they didn’t have to give up or lose when they were removed from their biological home or orphanage. It may also be the one thing they take away from their previous life that’s positive. Your child’s name is all they own. They left any family (siblings, parents, aunts, uncles, grandparents) when they were removed from their family. If they left an orphanage to join your family, they left behind friends and caregivers they may have grown attached to. They may have left behind toys, stuffed animals, or blankets (even if they only had one), and in drug homes these items are confiscated and discarded. If a child is lucky, really lucky, they leave their previous life with a trash bag. Our daughter came to us with two sets of clothes, our son, one, and neither brought a toy, stuffed animals or blanket. Many children have nothing to take with them. One thing, the only thing they do have, they do own, is their name. We have to recognize this. Changing a child’s name is not like changing a bald tire on your GMC, it’s not something to be taken lightly. Many parents think of it as giving their child a new name to go with their new life. Your child’s name is all they know, and crazy thing is, they may like it. It’s part of who they are. It’s a large part of their identity. Think about that. Identity. And what would a child feel like if their name, an essential part of their identity (because they really don’t know who they are yet because they haven’t been given the opportunity with love and acceptance) was changed? How do they think the parent changing their name feels about them? Think about something you would like to change in your home. A majority of the time when we want to change something it isn’t because we like it. Let’s say you want a new couch, well unless you really hate that your credit card is only in the double digits, you’re probably doing so because your tired of the one you have, you don’t like it anymore, or it’s ripped, broke, or dirty. Basically, you aren’t happy with it. This is how some children feel when their name is changed. They’re fully aware that you don’t like their name (unless you change it for the reason stated below) and you want something different. What they came with isn’t good enough and therefore it can easily transition to them feeling like you don’t think they are good enough. These feelings are already resounding in their head loud and clear. Some parents change their child’s name because it’s different, maybe your child is from another country or has an odd name. Fact: Different is in. Today parents want their child to have a different name, they spell it phonetically or choose a name they’ve never heard before. I know a baby whose name is Prator. Different? Yes. So the concerns about your child standing out because of their name isn’t such a concern any more. In my opinion, there is only one reason to change a child’s name, and that’s because of safety concerns. I know many adoptive families who’ve fostered, fear the biological parents will show up at their door or school and take the child, and thus changing the child’s name makes them feel safer. In some isolated cases this is true, but for many it’s not necessary. If the biological family lives in very close proximity, and I don’t mean that you simply live in smaller town, you may consider a change of name. And you may also want to consider the biological parents history. Most birth parents won’t come after their children (even when the parents are criminals), it’s very rare that this happens. If you feel you have to change your child’s name, there are a few considerations you might want to make. You can use part of their name, a middle name as a first name, or you can change their name slightly, transforming Jacob into Jake or Michael into Mike, it allows the child to keep a part of their name and helps keep it familiar. I also believe that if a name change needs to take place, there should be positive discussions about it. 1) Take your time, don’t whack a child with the news and not accept discussions. 2) Tell children, no matter the age, what you plan to do. 3) Involve your child in the conversation. Ask them what name they like, and listen to their advice. 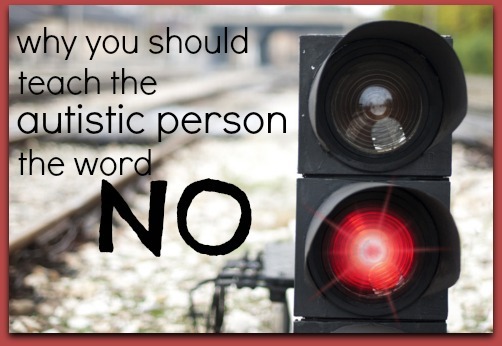 Get them involved in choosing a new name if you feel a change needs to be made. We must weigh whether changing a child’s name is necessary or if we’re doing it because of our own desires. Maybe we’ve always dreamt that our child will be graced with our grandmother’s first name, maybe we’ve picked out a favorite name for our future child. But the child must be considered, this isn’t like choosing an addition of black beans for your burrito at Chipotle. This is connected to something far greater than many parents give thought to. It’s identity. “Desi cries every time we’re in the car, no matter what I do she won’t stop,” Jason complained to his friend. “Oh, don’t worry, she’ll grow out of it, Zavier did that when he was young too,” replied Zack. 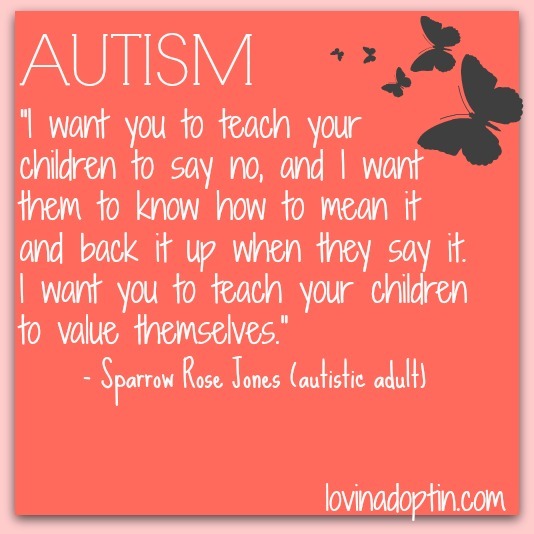 As parents of hurting children we hear this often, far too often. Our friends and family share their similar experiences on everything; picky eaters, criers, infants having difficulty weaning from the bottle, problems with potty training. We hear of teens who act out, use drugs and smoke to escape. Friends tell us of their teens who don’t listen, pre-teens who are promiscuous. But there’s a difference, our children didn’t get a healthy start in life with love, care, and affection. They were neglected, wondering when they’d be fed, never held, never soothed when they cried. They were abused, beat on, hit when they cried, yelled at when they asked questions, and heinous acts were laid upon them that we don’t even want to contemplate. 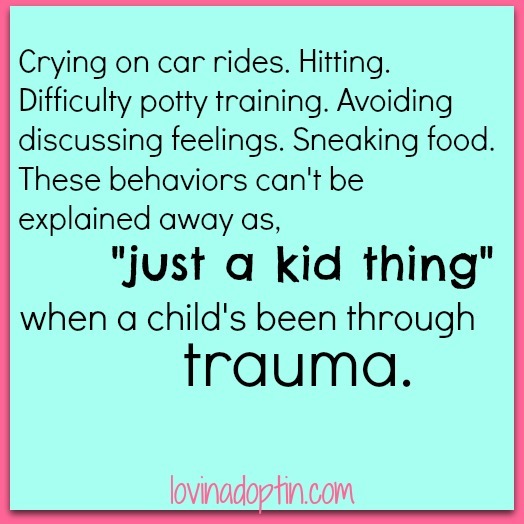 So, when an adoptive or foster parent says their child cries when they’re put in the car, we have to think outside of normal, outside that box that feels so comfy and safe. How many of our children were driven away from all they knew, in a vehicle? Most. When children are abused and neglected, even thought it’s terrible and frightening, it’s all they know, it’s familiar. So, when that social worker drives them away from their home, it’s daunting and scary. They don’t know what to expect, they definitely don’t expect something better. Even if children who lived in an orphanage before joining their adoptive family weren’t abused, leaving those walls is harrowing, sometimes that orphanage is all they know, and maybe it brought something better than starving on the street in a frozen desolate country. When any of these kids are taken to a new place, it’s scary. Maybe Desi, who cries every time she’s put in the car had a terrifying experience in a vehicle, and when that door closes, those horrific memories come back assaulting her, and she cries. Maybe Desi is afraid her new family will take her and drop her off with someone new, because whenever she was put in the car, she was abandoned on someones door step and her mom didn’t pick her up again for weeks. Yeah, we could chalk it up to colic, and a very small part of it was (because we worked on changing his formula and finally found one – plus gas drops – that decreased his crying by a minimal percentage), but a majority of his distress was caused by something else. Trauma. Jeremiah’s biological father had let Jeremiah cry, he didn’t sooth him, and didn’t feed him nearly enough. Eyewitnesses saw him pushing Jeremiah around town in a stroller, while Jeremiah screamed, his bio father never doing anything to help the newborn. The same eyewitness saw the bio dad pushing Jeremiah in a stroller around town when it was fifteen-degrees outside (he wasn’t going to work, his travels sometimes had no purpose). Jeremiah hadn’t yet learned that crying wouldn’t bring any comfort, it takes time for infants to learn that crying won’t bring food, a soothing back rub, rocking, holding, someone to change a dirty diaper, a mother to sing lullabies to help him go to sleep, a nightlight for the overwhelming darkness, something to look at from the bottom of the empty crib. Until a child learns that crying gets him nothing, all he knows is crying, because that’s what babies normally do to get what they need. All Jeremiah knew was crying and being uncomfortable. So no, avoiding the real issue and hearing that my friend’s brother had colic too made me mad. Sometimes our friends and family forget what our children went through, or they try to pretend, and want to believe that everything’s okay. They don’t believe that extensive trauma causes a plethora of issues, they don’t think people treat infants and children so horribly, to them it’s impossible to believe. Sadly, parents and caregivers do these horrific things and we need to recognize it if we’re going to help our children. Another thing our two children did was stay awake on long road trips, even one that lasted twelve-hours. We’ve heard from other non-adoptive parents that their children don’t sleep much in the car either. Neither Payton nor Jeremiah slept in the car for several years after they came to live with us, whether the trip last three-hours, seven-hours, or twelve-hours. In Payton’s case, we know she was left with strangers constantly, we’ve heard horror stories about some of the people she was left with. She lived in several foster homes before she came to us, and it’s no wonder her eyes were peeled on the road ahead when we took long road trips. She held them wide open as if invisible toothpicks were holding her eyelids open, no soothing, comforting words could convince her all was going to be okay, she could rest. No words, No actions. Just time. Friends of ours adopted their two girls from Korea, and they’ve told us their daughters did the same thing, it’s as if it was exactly the same story, only different kids from another country. There’s a really good chance Payton did this because she was afraid we were going to take her somewhere, drop her off where she would be abused, and never see her again. It broke my heart. But because my heart broke, I was able to help her in the ways she needed. Getting mad doesn’t fix it, blaming the child doesn’t fix it. 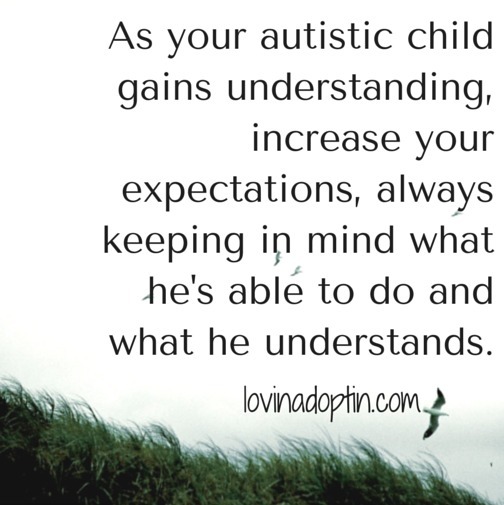 Having compassion and a willingness to meet your child where they are and dedicating yourself to them is what fixes it. No, Payton didn’t do this because she was “that way.” It wasn’t a “normal kid thing.” It was trauma based, and we needed to recognize this. 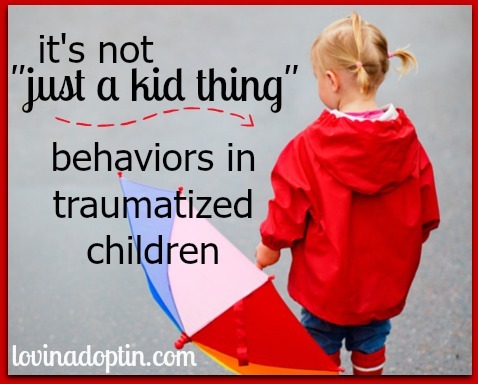 So, when a hurting child hits, we don’t blow it off and say, “It’s just boys,” we have to address it where our child is, talking about what’s going on inside them, discussing feelings. Maybe that child’s father hit him, and taught him hitting was the answer, thus you have a child who hits, and it’s not “just a boy thing.” Saying “Stop it Daniel!” won’t help (although you still intervene), you have to dig deeper, get down to those feelings. When friends and family tell you, “My kids did that too, she’ll grow out of it,” or “Don’t worry about it, it’s a kids thing,” or “It’s normal,” know that your story is different. Your kids didn’t have their beginning. Your kids need you to recognize this and help them through it in an understanding and compassionate way. What do you do when others give you this parent mantra? Do you respond, and how? Everyone has opinions, and when you adopt or foster, you get ideas on how you should raise your kids from every which way. Birth mothers want to be called “mom,” or “mother,” but you want to refer to her as “birth mom.” Your son would like to call her, “tummy mommy,” but his birth mom wants to be referred to as “Mom.” What do you do? 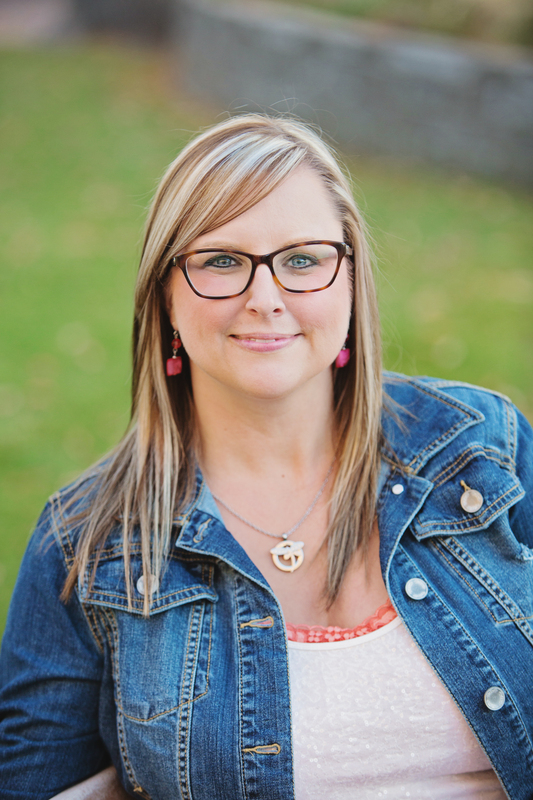 Older adoptees share their opinions on how we should raise our kids, what we should tell them, what not to say. 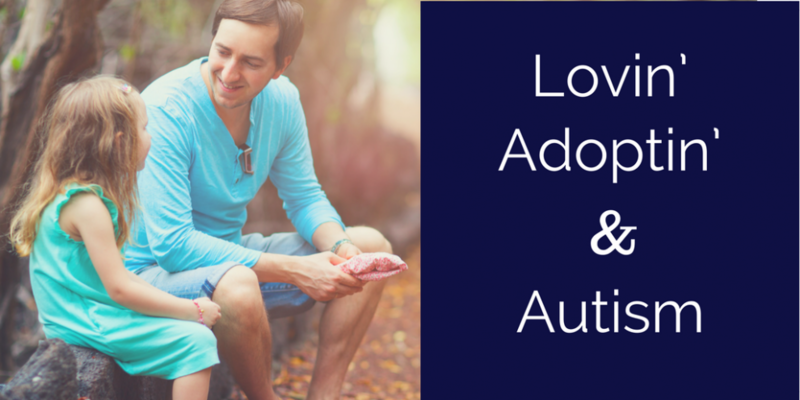 Our world is so focused on always being politically correct, and yes, there’s definitely a necessity for that, but it seems that in the case of adoption it takes away from what adoptive parents want. It’s as if our opinions don’t matter, and I’ve been told by adoptees exactly that, my feelings and perspectives don’t matter. Other parents have been told by their child’s biological family what to do and what terminology to use. But my feelings as an adoptive parent do matter, because I’m the one who adopted my child, I’m the one who’s raising them. As for the opinions on biological families, for some adoptive families it works well to have the birth families (or some of use the term “biological family”) over for holiday celebrations, but for others that would be *beep* on wheels. It would not go well, and it wouldn’t benefit our children. Why? Because each of our children have different stories, different backgrounds, different needs, different relationships with their biological families. No one person can tell everyone else what to do with their adopted or foster children. Just as in families who have all biological children, you won’t see two families who do things exactly alike. No one group of adoptees can tell every adoptive family how to raise their kids and how it’s going to end up in the future. Is it important listen to adoptees? Absolutely. However, when their opinions come with too many absolutes, then it’s time to beware. 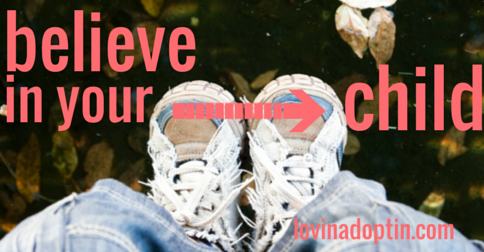 As adoptive parents we can also choose the voices we want to surround ourselves with. 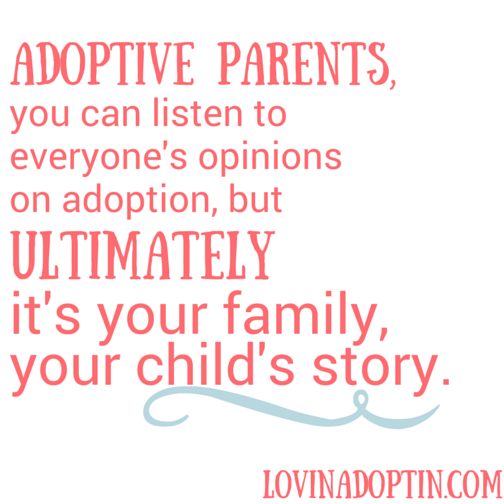 We can hear the less positive opinions from adoptees about adoption and foster care, but we can choose not to surround ourselves with it after hearing it the first time. After hearing what those involved with Flip the Script had to say, I was told I didn’t want to hear what they had to say. I wasn’t the deaf one, I heard them. It’s kind of like a pregnant woman. Does she want to hear negativity from the mother whose birthing experience was horrible, endless hours of excruciating pain, how carrying that child wrecked her back, she was bed-ridden, unable to do anything she enjoyed. Or, do would the newly pregnant mother want to surround herself with mothers who had a good, positive experience? Will she hear the negative? Yes. But what will she choose to listen to the most. And I would like to add, it’s ALL in the way it’s said. Many adoptees involved in the Flip the Script movement tell us we need to listen to them, and that us adoptive parents don’t matter in the equation. I love what Madeleine says. It’s true, our children’s voice comes first. Then come ours (shocker) because we’re the ones raising them. We should listen to others who’ve been there, but we get to choose who we want to surround ourselves with. 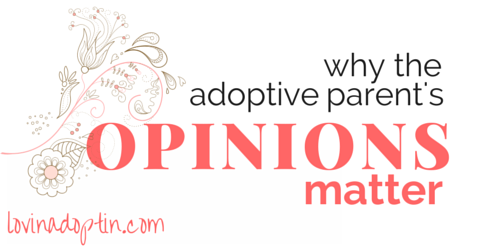 Unlike what some adoptees would like us to think, each child will have their own views of their adoption. Yes, it’s up to us parents to listen to a variety of voices on the subject, including those who’ve been adopted and fostered, but those voices are going to vary too. Because everyone has their own story, shaped by their own experience. Are Your Worries About Your Child’s Future Stealing Joy from the Present?